Living for hundreds of years with the self-sufficient ahupua`a land-tenure system and a communal subsistence economy, Hawaiians, particularly commoners, were unaccustomed to the concept of fee simple land ownership. This unfamiliarity, coupled with numerous legal and logistical constraints, led to foreign acquisition of large amounts of land intended for Native Hawaiians. Many Hawaiian families were required to leave the lands they had cultivated for generations and were forced to move to populated towns such as Wailuku and Lahaina. Lahaina is a fascinating place. Most tourists probably just see it as an open-air shopping mall, loaded with trinket shops, t-shirt purveyors and burger joints sprinkled throughout a "historic whaling village," as the Maui Visitors Bureau calls it. But that's just marketing nonsense, told and retold so often many locals probably believe it by now. That's why the new book Tourism Impacts West Maui is so radical and necessary. It upends all the "official" stories about Lahaina and the rest of the Westside, shakes them until all the tourist marketing nonsense shatters, then gives a straight telling of what really happened. For many visitors, Lahaina represents "Maui," but it's really just a Disney-esque facade, built on more than a century of tidy corporate narratives that minimize or erase actual Hawaiian history. 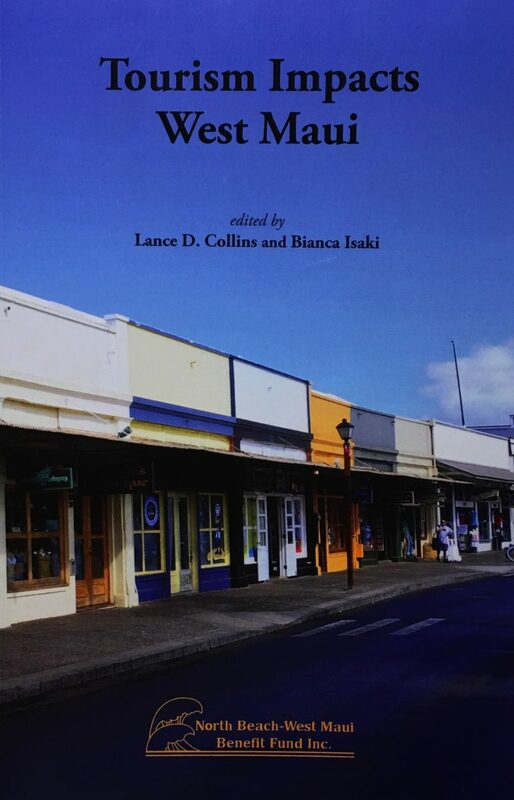 This book, which is a collection of academic essays edited by Lance Collins and Bianca Isaki (and published by the North Beach-West Maui Benefit Fund), sweeps all that away, providing a new series of explanations for why West Maui looks the way it does. It's not a pretty story, but it's a vital one–especially for locals interested in issues like public access and social justice. There are nine essays in the book, covering subjects as a look at land claims in Wahikuli, memories of plantation labor, the social/historical perspective of Lahaina's annual Halloween festivities and the tortured history of the Lahaina Bypass. All appear under the same theme: American capitalism and private property rights, first brought to Hawaii in 1848 through the "Great Mahele" (the subject of the Maui Island Plan quote that begins this piece), did so much damage to West Maui that we're continuing to live with its effects to this day. Though much of the book is wrenching, there are moments of surprising mirth. Charles Devaney's brief essay, titled "Attempt to Map the Existing Trails of West Maui," is a gem, full of both dry humor and head-shaking sadness. Put briefly, Devaney and a colleague flew to Maui from Oahu to map West Maui's public trails. "We landed in Kahului, picked up our rental car and made our way to Ka`anapali where we would be taking residence for the next three weeks," he wrote. "Some of the conversation that took place was about how many times we thought we were going to summit Pu`u Kukui." I laughed out loud when I read that. In fact, as any resident could have warned them, Devaney and his colleague–though checking out every public road into the mountains they could find on maps–found nothing but locked gates and "No Trespassing" signs–access closed by big operations like Maui Land & Pineapple Company and Kamehameha Schools, none of which bothered to respond to his requests for access permission. But a personal favorite is Sydney Iaukea's essay on "heritage tourism" in Lahaina. Iaukea, who holds a doctorate in political science, worked in the service industry in Ka`anapali in her youth (she was also named the first "Miss Lahaina" in 1992). Her essay, "The Re-Storing of Lahaina," uses meticulous research to strip away the tourist-marketing that so clogs the town today. "Lahaina was built and preserved to mimic a whaling town so that tourists vacationing at the newly built Ka`anapali Beach Resort could visit after long days of rest and relaxation," she wrote. "However, the whaling tale that was recreated had very little in common with the actual industry that existed a century and a half prior. As this whaling historical record was foregrounded, all other social narratives of Lahaina took a backseat, with the missionary influence vying for a close second." Lahaina, as Iaukea notes, was only really a whaling town between the years 1842 and 1860. What's more, none of the buildings on Front Street were specific to the whaling industry (in fact, just one actual whaling structure remains in the entire town–the Spring House, located near the Wharf Cinema Center). That's why, as Iaukea wryly noted, the architectural design guidelines for the Lahaina Historic District mandate "Nantucket" and "Victorian" styles. In fact, Lahaina Town was a plantation town, built literally on the bones of the old Hawaiian Kingdom's capital–Moku`ula, which featured a small island constructed in the middle of fresh water ponds, fed by streams running down from the West Maui Mountains. Of course, the Pioneer Mill got rid of all that. "This rich natural environment existed for centuries before the Pioneer Mill Company installed vast irrigation systems in West Maui that diverted most of the fresh water across the plains to the drier areas for sugar cane production," Iaukea wrote. "These massive water diversion projects produced stagnant waters, which are said to have introduced mosquitoes in Lahaina." After using Moku`ula for "dumping grounds," Iaukea writes, the Pioneer Mill covered it with a baseball field, which remains there to this day. Keep in mind that these essays are largely works of academia, with all the jargon and clunky sentences that academic writing holds. But their ideas and thinking are refreshing and even invigorating, like inhaling a few gulps of pure oxygen after spending the day in traffic. Collins told me the book will be available for sale at the University of Hawaii Press website starting Dec. 20. Or you can order it from Barnes & Noble or the Maui Friends of the Library bookstores. UPDATE: On Dec. 16, Collins emailed me to say that UH press's warehouse in Honolulu is being fumigated and, because of that, the press won't release any titles that have come in during the last two weeks to their marketing department, which puts the books online. That means, according to Collins, that the books aren't likely to be available until Christmas, at the earliest, though an exact date isn't available at present.